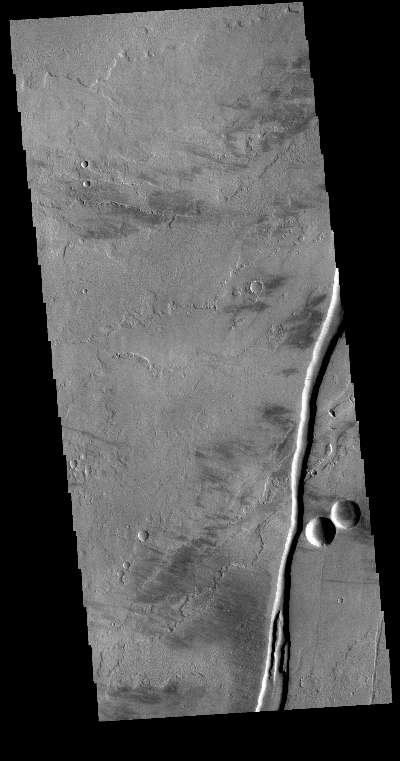 The linear channel in the bottom half of this VIS image is part of Olympica Fossae. Olympica Fossae is a complex channel form located on the Tharsis plains between Alba Mons and Olympus Mons. It was most likely created by volcanic flows, but was probably also affected by the formation of graben in the region. Graben are formed by the down-drop of material between paired faults. The collapse of the Alba Mons volcano resulted in a huge region of graben.